Sen. Tom Cotton (R., Ark. ), speaking Wednesday at an event about China's mistreatment of minorities in Xinjiang, argued that China's repression of its citizens "enables aggression abroad against America and our allies." Cotton said China has "always felt a deep insecurity and even fear about its western hinterlands, Tibet and Xinjiang." "China sees its giant western provinces as a critical buffer against rival powers. 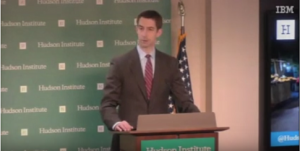 China also uses these provinces as a staging ground to project military and economic power into Eurasia, so ever since Mao took over the country in 1949, the regime has done everything it can to bring these territories to heel, not least by overwhelming and erasing the native minorities through population transfers," Cotton said. The Arkansas senator also pointed out that Xinjiang's location gives China access to Central Asia and the Middle East, and therefore serves as "the gateway to the Eurasian empire that China hopes to build." "Paradoxically, western regions like Xinjiang are also important to china's aspirations on its eastern shores. China seeks total control over its own western territories so that it can project power and create a sphere of influence throughout the Asia-Pacific region and ultimately the world," Cotton said. "This is another reason we must care about the fate of Xinjiang: China's repression at home enables aggression abroad against America and our allies," Cotton continued. Cotton concluded his remarks by tying China's actions in Xinjiang to the dystopian world George Orwell described in his book 1984. "China has a plan for the world and it's as concrete as the prison cells where it keeps its dissenters. Make no mistake: The brutal police tactics in Xinjiang are not just an assault on that province's native people, although they are surely that. They're also an assault on the American-led world order and a disturbing premonition of an alternative world order, one controlled by the Chinese Communist party and one that ends in Room 101," Cotton said. "1984 may be 35 years in the past now, but for China 1984 is always the future," he added. Room 101 is a reference to the torture chamber housed in the Ministry of Love in Orwell's novel. Prisoners taken to Room 101 are confronted with their greatest fear. The event, hosted by the Hudson Institute, also included a panel of Uyghur human rights leaders and experts. China's government has targeted minorities in Xinjiang, especially Uyghurs, and has set up re-education camps. As many as one million Uyghurs have been imprisoned in camps. Nury Turkel, chairman of the Uyghur Human Rights Project, warned at an event on Tuesday that Chinese president Xi Jinping is "determined to stamp out Uighur identity entirely."